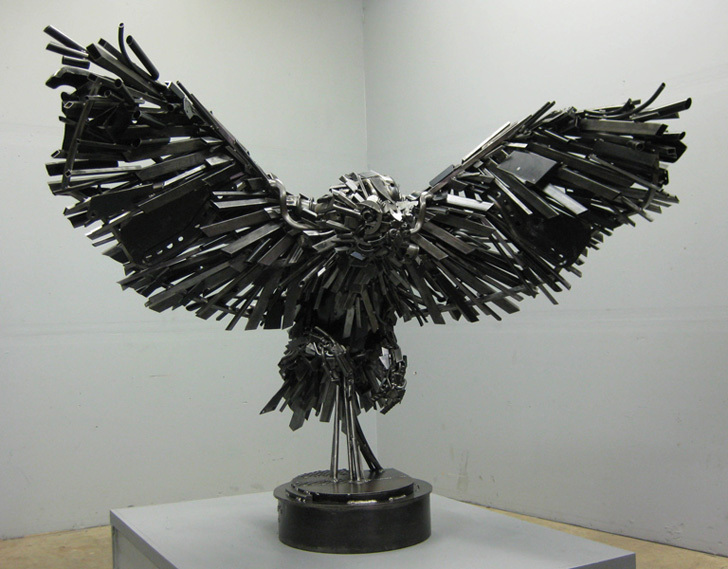 These recycled scrap metal sculptures by Robert Jefferson Travis Pond of Steel Pond Studios are wild in more ways than one. 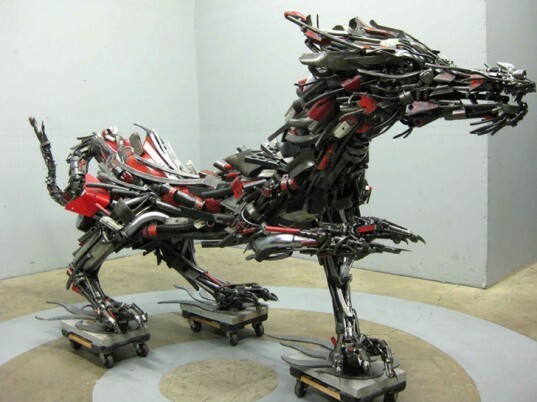 The Portland based artist creates life-size, often larger than life art works of beasts, birds and fish from pieces of deconstructed motorcycles. He welds together a mass of elements, from the gas tanks to the nuts and bolts that once held the bikes together, to create stunningly expressive and somehow organic creatures. Travis Pond’s 14-foot long Dragon is a cacophony of twisted exhaust pipes and metal rods, all assembled into an intricately detailed beast, with smooth lines and a sleek reptilian tail punctuated by the bright red tones of the Honda and Yamaha motorbikes from which it was made. He references motorcycle culture and the very nature of his beast with playful metal flame forms reaching back from under the Dragon’s feet. His Cranes, while still fierce in their mechanical construct, take an altogether calmer tone in their loitering, watchful postures. Meanwhile, his Rooster is almost comical, presenting the creature’s diminished, meek stature through playful curls of scrap metal and creeping rust. Click here to see a video of Pond at work constructing the Dragon. A larger than life Elk made entirely from recycled material. The antlers of this Elk from Steel Pond Studios glisten atop the imposing structure in John Deere colors. In his Tiger, Pond finds fabulous abstract representation of the animal's color in his careful use of deconstructed motorcycles. This detail of one of Travis Pond's Cranes shows the precision with which he welds together small pieces of scrap to create his large scale art work. Meanwhile, his Rooster is almost comical, presenting the creature's diminished, meek stature through playful curls of scrap metal and creeping rust. The sculptor, Travis Pond of Steel Pond Studios is dwarfed by his own scrap metal beasts.